With the abundance of fish in the three pristine lakes in Branson, you will know the reason why the lakes are known as the best destinations for winter fishing in the Midwest. The tri-lakes area that covers Lake Taneycomo, Table Rock Lake and Bull Shoals Lake are loaded with a variety of fish species such as trout, largemouth bass, spotted bass, black and white crappie, blue catfish, channel catfish, walleye, bluegill, and much more. Many of the state parks along the lakes also attract anglers year-round. Fishing enthusiasts in Branson don’t think of winter as prime fishing season, but avid trout anglers are devoted enough to brave the elements that winter is prime fishing season in the Ozarks. The smallest among the three lakes, Lake Taneycomo has only 40 miles of shoreline, but it’s one of the best trout-fishing lakes in the country because the lake is stocked with three-quarters of a million rainbow and brown trout each year. And its cold waters make it ideal for winter fishing. The lake is also known to many anglers as a great fishing destination for beginners and professional anglers because it offers something unique for everyone. Whether you are a novice angler or an expert, this is the place to test your fishing skills against some of the largest trout in the country. Lake Taneycomo is considered angler’s paradise because of its abundance of trout during winter season. The cold waters of Lake Taneycomo produce more trout than any other lakes. In fact, the lake can produce 750,00 trouts each year. Winter fishing on Lake Taneycomo depends on the water flow. Down the lake, the deep water runs slower which allows trout to grow to enormous sizes. 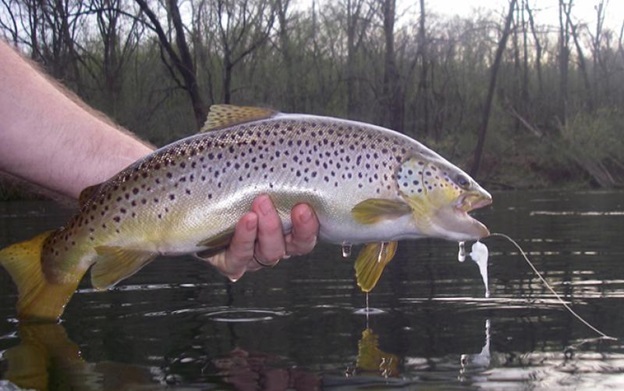 Many fishing aficionados believe that it will be in Lake Taneycomo that the next world-record brown trout will be angled out. Table Rock Lake is widely known as one of the best vacation destinations – thanks to its 43,000 acres of water and thousand miles of beautiful, tree-lined shores. Southern Living ranked the lake as one of the south’s greatest lakes and it is renowned as among anglers for its bass fishing. The lake also boasts a beach and marina and it’s a popular stop for scuba divers and many other great water activities. Table Rock Lake made national news in 2015 when an angler snagged a 140-pound, 9-ounce paddlefish from its waters. Although Lake Taneycomo and Table Rock Lake often share the limelight, Bull Shoals Lake is considered also as a popular spot for anglers and folks who want to enjoy a variety of lake activities. The lake has plenty of clear waters and is good for scuba diving. But Bull Shoals is ideal for fishing, as several Missouri record catches come from the side of this lake. Among those records are a 13-pound, 14-ounce large mouth bass; a 65-pound, 2-ounce striped bass; and a 21-pound, 1-ounce walleye. The tri-lakes area in Branson is considered by many as angler’s paradise because it is known as the best destination for winter fishing.